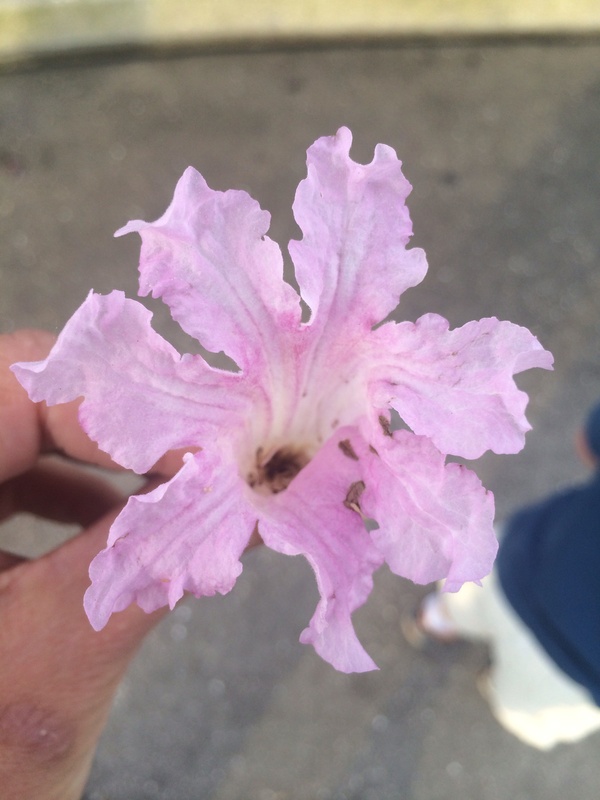 Rather than my typical Friday favorites (because I’m woefully behind on blog reading this week! 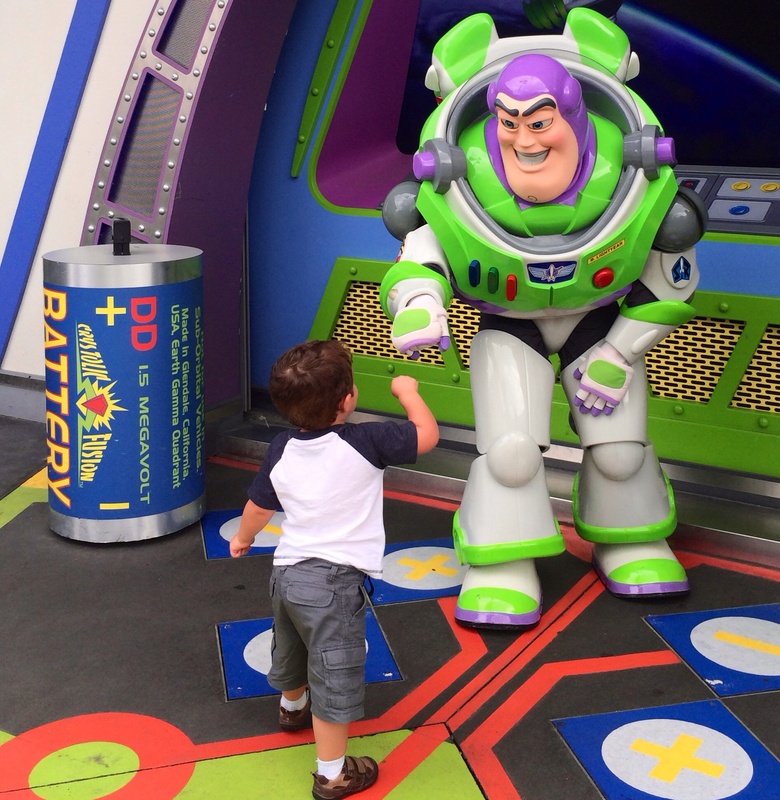 ), I thought I’d share some of my favorite Disney moments so far this week. It’s been so amazing to see Disney through O’s eyes and of course the half marathon was a great experience (recap Monday!). I can’t believe we head back to the real world tomorrow! Totally unexpected character along the course – I had to stop because I knew O would love to see her! 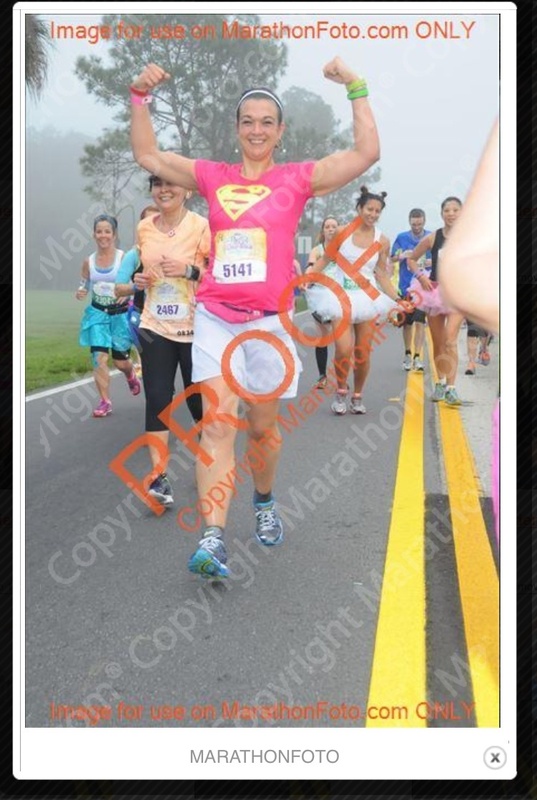 My favorite race preview pic so far! 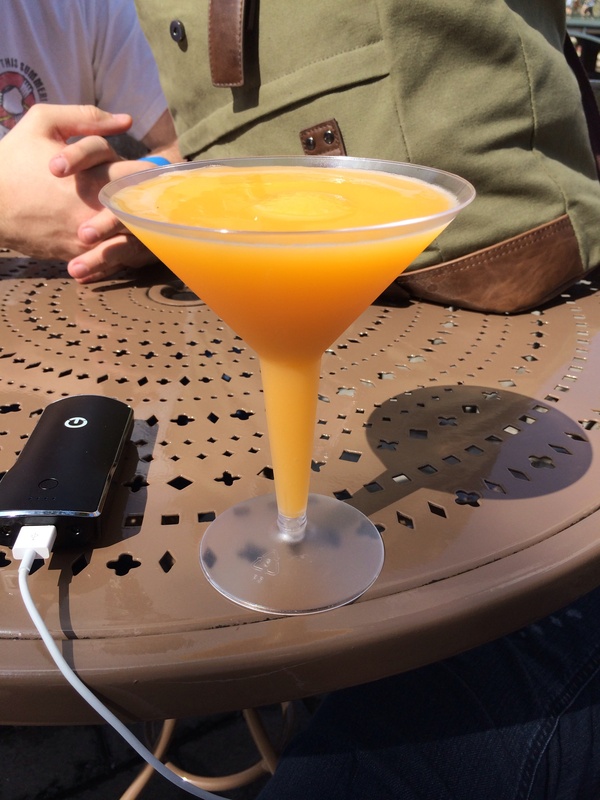 Favorite post-race treat: Grand marnier slushie in Epcot France! 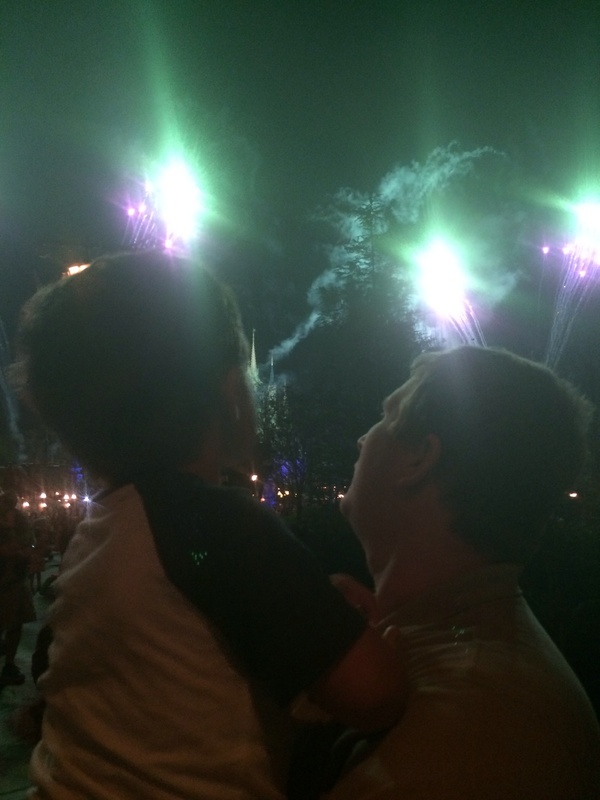 We came out of dinner at Be Our Guest in the middle of the fireworks show. O was amazed! 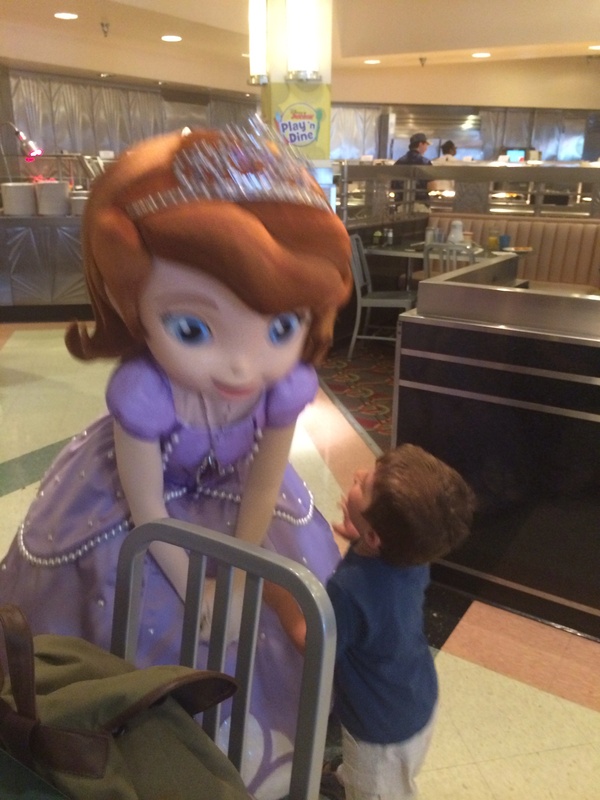 Except maybe this – I cannot tell you how excited he was in this moment, to meet Princess Sofia. 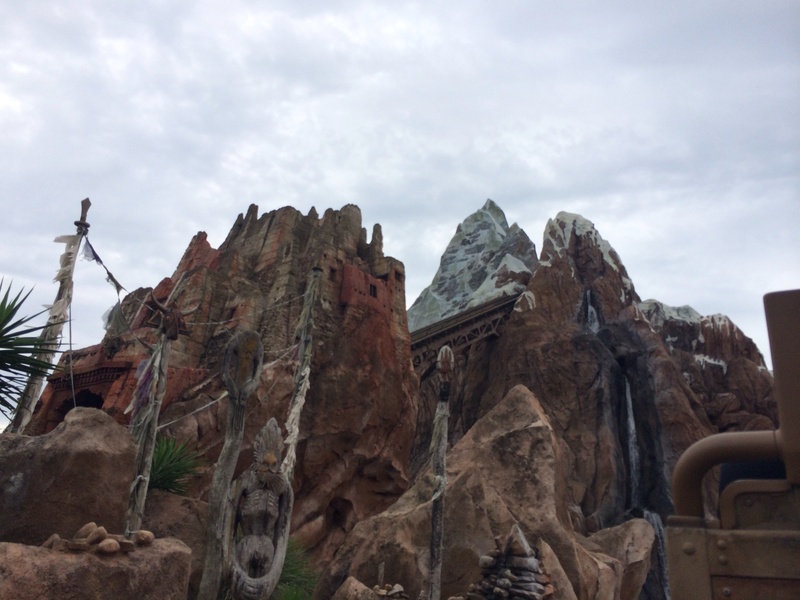 Some grown up thrills too, including two trips on Expedition Everest – one of my favorite rides! I still jump every time I see the yeti hanging over head. Race Retreat & Platinum ChEAR Squad: Was it worth it? 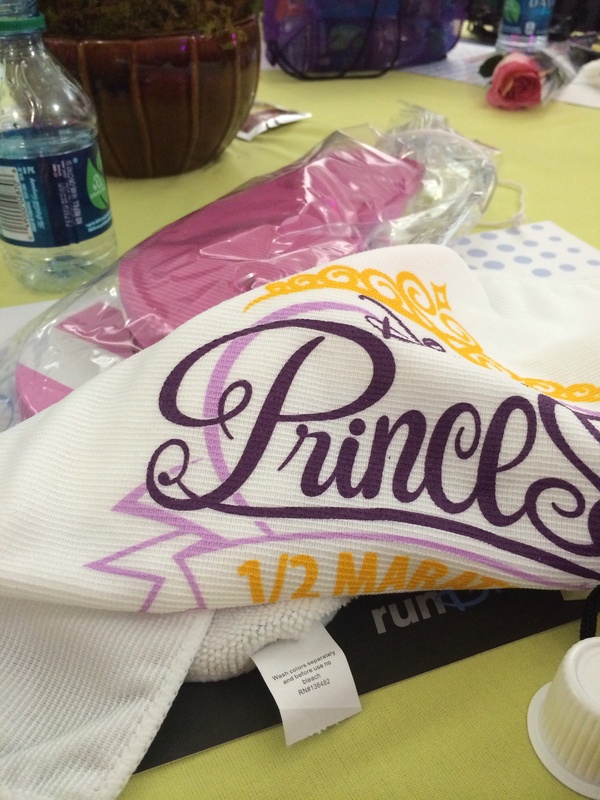 For the Princess Half Marathon, we decided to splurge on both the Race Retreat and the Platinum ChEAR squad. We did this both for my comfort and for my guys who would be waiting at the finish. – Given how early it starts, how nervous I know I’ll be and how long we have to wait around, the idea of a sheltered, structured place to wait rather than milling around outside is very attractive to me. Also, as I’ll be trying to quietly sneak out of our room at 3 am without waking up my 2 year old, breakfast at the site was an attractive option. I also like the idea of having something to “do” when I get there – breakfast, stretching area, etc, to help with my social anxiety as I’m waiting there alone for all of this to start (as alone as one could be among thousands of women anyway). – The primary driver for us was actually the Platinum ChEAR squad side of the equation. Having a sheltered place for my husband and our two year old to wait for my finish seemed really wise. 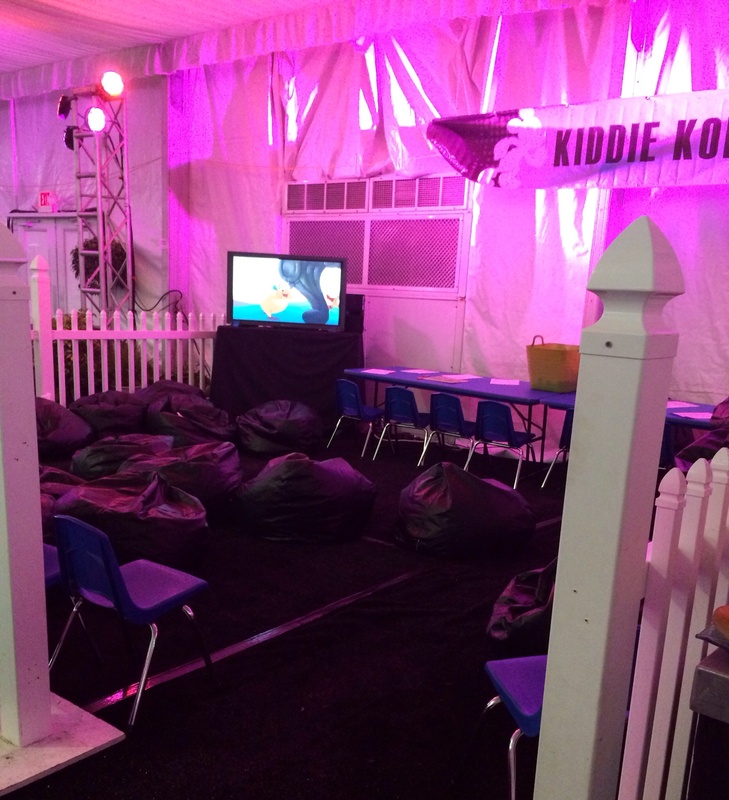 We thought the breakfast and entertainment offered for spectators in the tent, as well as the chance to watch on the TVs if the weather precluded actually getting outside with a two year old, was worth every penny and if they’re going to be in there after the run, I might as well join them. We read lots of reviews and reports about the Race Retreat and ChEAR squads (like this one) and the consensus seemed to be that it was nice but non-essential unless the weather was bad (which we unfortunately can’t predict ahead of time!). We registered for both options online via Active.com. You don’t have to choose these options at the time that you register for the race. It was several weeks after I registered for the half marathon before we finally decided on adding the Race Retreat and ChEAR squad. These theoretically sell out, but I know PHM slots were still available for months after the race itself sold out. Children under 3 are free for the Platinum ChEAR squad, so we had to pay for only one adult for the Platinum ChEAR Squad and one adult Race Retreat. I then picked up the arm bands at the Expo when I did packet pick up. I’d printed out my receipts for both, but didn’t have any problems with gathering everything. The Race Retreat opens at 3:30 am and is runners only until 5:30 am. There is a dedicated bag check for Race Retreat participants (which literally took seconds), a padded stretching area, private Port-a-Potties and breakfast. The breakfast options included bagels, oatmeal, fruit and coffee as well as water, soda and Powerade. I appreciated having a table and chairs to sit at while I sorted out my thoughts, my gear and my breakfast. With my nerves, I would have never been to balance things while standing or sitting on the ground outside! I also appreciated that they had oatmeal,which is my usual pre-race breakfast. 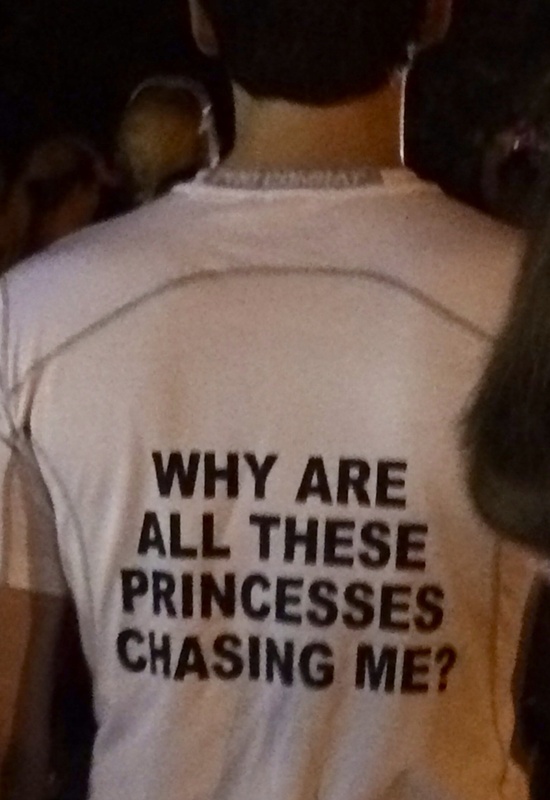 I enjoyed chatting with the other runners at my table, but didn’t feel like I had to be too social which was nice. There were private port-a-potties, but it was a mad house back there! No clear lines and not nearly enough stalls. They did start waving women over to the men’s side, which helped, and it was probably still faster than the giant lines outside but it was surprisingly disorganized. 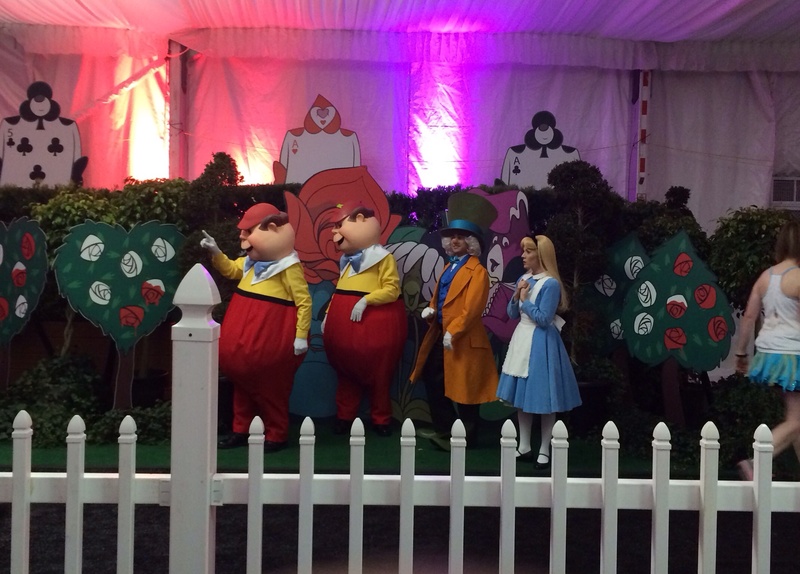 There were also Alice in Wonderland characters for photos. I didn’t feel like waiting in line for pre-race photos, but O and I did get a post-race photo with the Queen of Hearts and the Mad Hatter. 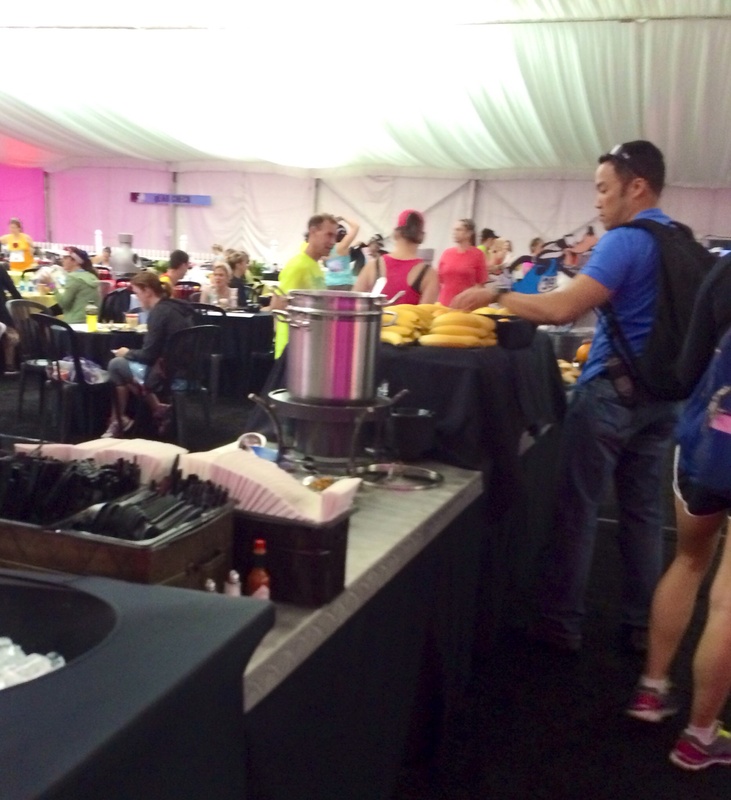 After the race, in the Race Retreat tent there are hot breakfast options, a self-administered first aid stations for ice, BioFreeeze, etc, and $10 mini-massages. There is also a TV to watch the live feed of other runners coming in and access to runner tracking if you want to see how other friends are faring. There is also a private changing tent if you want to get out of your sweaty clothes and characters for photo opportunities. After I exited the finishing chute, I met Darrell and O in the tent. It was nice to be a little out of the way. The breakfast was nothing exciting (muffins, melon, pineapple, scrambled eggs with cheese, potatoes, bacon, more oatmeal) but it was warm and I was hungry. 🙂 I also took advantage of the changing tent. I really appreciated the chance to get completely out of the sweaty clothes so fast! We received a commemorative towel and pair of flip flops, which were nice but nothing big considering the price of the whole package. The brunch buffet is available until 10 am on half marathon day, which left me with plenty of time to eat up with my boys. The offerings were fairly generic breakfast foods (potatoes, eggs, bacon) but much appreciated after 13 miles. By the way, via the Platinum ChEAR squad my hubby also got a stadium blanket, t-shirt (they ask for the size when you register via Active initially and it is picked up at the Expo) and “clappers”. There are also dedicated viewing areas along the course and spectating tips. Honestly, if O was older, we’d probably just go with the Bronze level ChEAR squad to get the spectating tips without worrying about any of the rest of it but for this year, the protected spaces were worth it for our little family. I’ve been asked by several people recently how I’m going to handle a week in a theme park while still eating healthy foods on Weight Watchers, so I thought it would be perfect Weight Loss Wednesday post for my vacation week. I’m on vacation, so I’m definitely not going to restrict myself and I am going to remind myself (frequently, knowing me) that I will not regain 110 pounds in one week at the “happiest place on Earth”. However, that doesn’t mean I treat vacation as an excuse to go overboard in terms of dietary choices. Part of learning to maintain my weight loss and truly embrace a healthy lifestyle is learning to make reasonable choices in all situations. There will of course be more splurges at certain times in a normal life, like at the holidays and on vacation, but I have be careful or every occasion will become a splurge worthy occasion. I was a little less nervous about this vacation than my first Disney vacation on Weight Watchers because a) I’m much more confident in my ability to self-regulate now, b) I’ve just finished a half marathon so I think I have some activity points to burn in turns of eating and c) I’ve gotten through a Disney cruise and prior two day trip to Walt Disney World, so I’ve learned some things. I’m really hoping to come out of this trip with fewer regrets than the last one. – Make plans to have a healthy breakfast every day. For me, this means bringing my usual travel packets (link healthy eating while traveling) of oatmeal with PB2 to make in the hotel room coffee maker. We’ve also used Garden Grocer and Amazon to deliver fruit and applesauce/yogurt pouches so that we can eat a healthy breakfast in our room each morning before we head out. It is a lot easier to resist the smells from the Main Street Bakery (which is just Starbucks now anyway – not worth the splurge) if you aren’t starving when you get there. – Check out dining options ahead of time so you know where you are going to have the most healthy choices. On our last trip, we really enjoyed the fruit stand by the Hall of Presidents. It had lots of options, beyond the apple or banana you could get at the snack carts throughout the park. 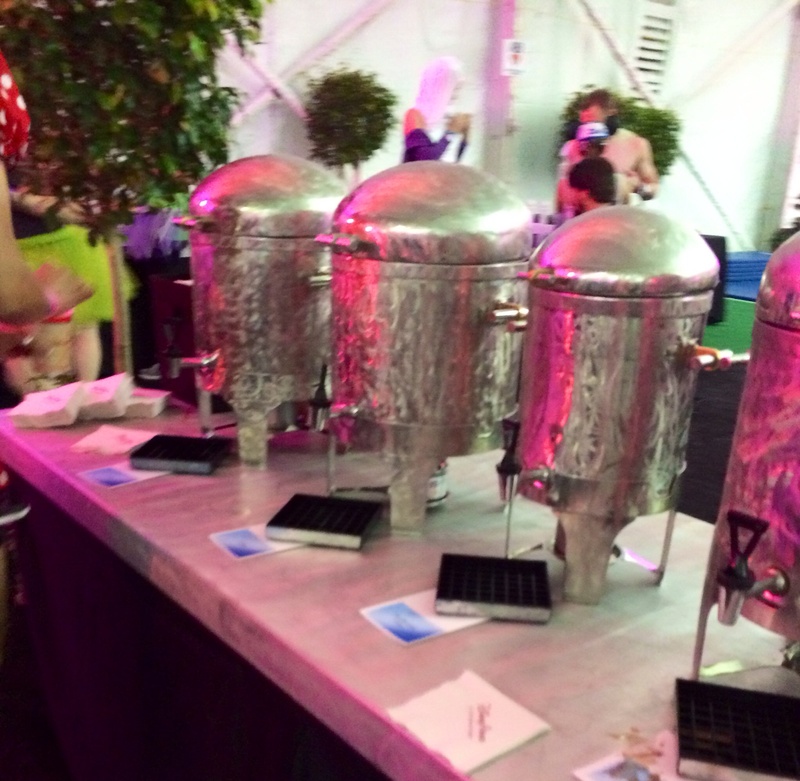 We also did Pecos Bill and Cosmic Ray’s for lunches. The rotisserie chicken at Cosmic Ray’s is huge enough to share and came with a fresh veggie side. Most counter service and table service places will have a sugar free dessert option as well, which is helpful since you’re given dessert with your meal if you’re on the dining plan. There are menus available at AllEars.net (link below) and several sites list specific dining recommendations (see links below) for each of the parks. 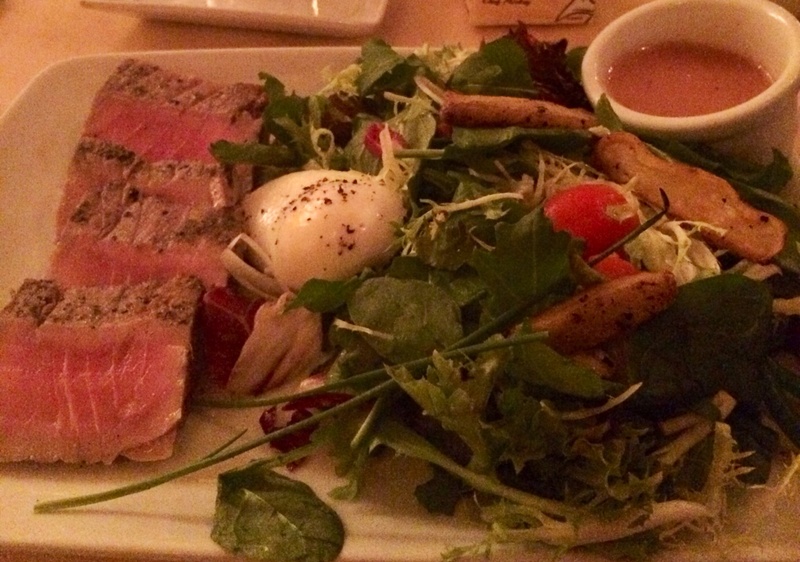 So far, we’ve done Magic Kingdom (this gorgeous salad at Be Our Guest for lunch!) and Epcot, which is probably the easiest park to find the healthier options in. – Speaking of Epcot, while it has a lot of healthy options (I love the Tangierine café in Morocco) it also has some truly spectacular pastries and treats. My approach to those is A) one treat a day, so I have an afternoon snack in France, no dessert at dinner – a very worthy trade and B) make sure it is worth it. Any baked good in Epcot = worth it. Dole whip = worth it. Coffee cake at the Starbucks that used to be Main Street Bakery = not worth it. – Drink lots and lots of water. Thirst can easily be mistaken for hunger and you’re definitely going to get thirsty doing all of that walking in Florida. Carry a water bottle to refill or be prepared to shell out lots of cash for water in the park. We had a case of bottled water delivered to the room and bring a couple of bottles in with us to refill during the day (with Mio or Nuun to mask the flavor of the Florida water). – Consider ordering a kid’s meal as they are a) small portion sizes, b) marked so that the healthier options are easily recognizable and c) default to fruit / veggie sides rather than fries or chips. – For table service dining, use the usual rules for any buffet or family style options. Check out everything first, then decide where you’re going to invest your calories/points. I’ve liked the family style options we’ve done at Liberty Tavern and the Garden Grill because leaner meats and loads of veggies are available, without me having to asked to sub a starchy side for veggies. Do not be afraid to ask for those substitutions though! Or to ask for anything! Disney dining is generally very accommodating, as far as telling you how things are prepared or letting you get sauces on the sides. You can call (407-824-5967) or email (SpecialDiets@DisneyWorld.com) if you have specific dietary concerns they need to address. 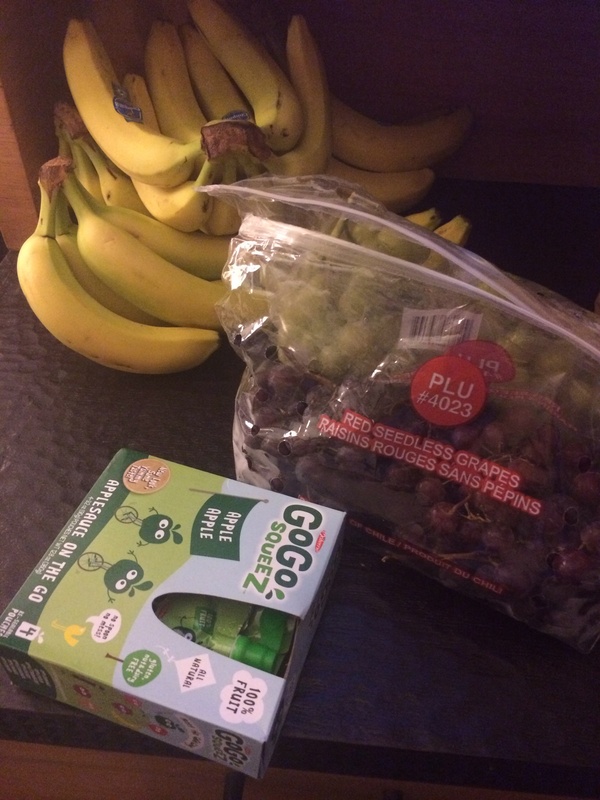 – In addition to ordering groceries for breakfast in the room, we’ll also be bringing along some healthy snacks with us to the parks including fruit that travels well, applesauce pouches and FiberOne bars. There are also usually Grab and Go healthy options with fruit cups, veggies, etc in the resorts. We utilized that option primarily on our last trip because I didn’t want to deal with ordering groceries for just a day and a half trip following the cruise. 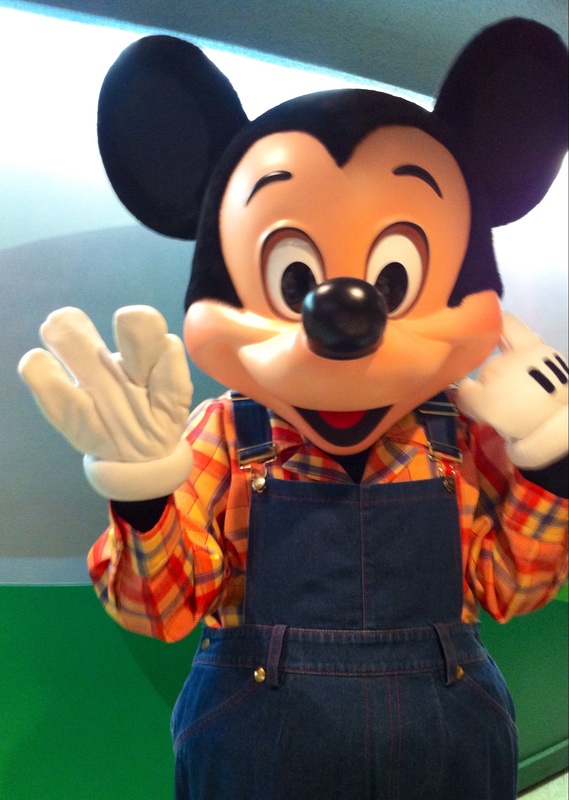 The most important thing I can advise is not actually about your time in Disney World itself. Enjoy that time. Soak up the good moments and try to forget the bad. When the vacation is over, vacation eating needs to be over. Don’t let your week of indulgences on vacation turn into ordering pizza because you’re too busy unpacking to cook or stopping at McDonald’s for burgers because you’re depressed about leaving Mickey. Have a plan in place for a healthy meal as soon as you get home so that you can kick yourself back into your normal gear. 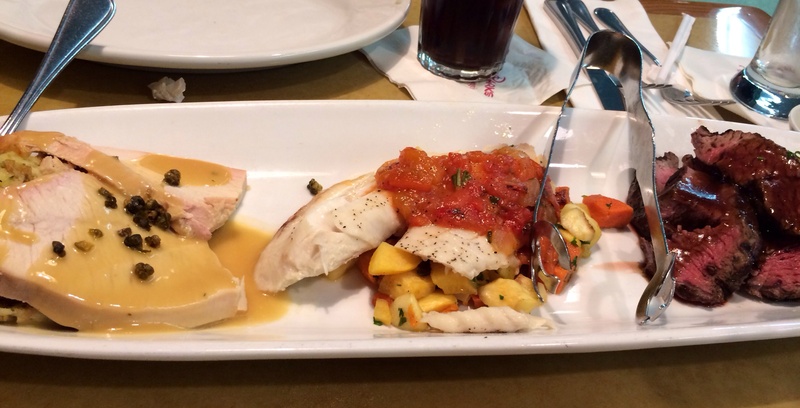 For me, that typically means stopping for lunch at Jason’s Deli on the way home from the airport after I travel. You could also have something quick and easy in the freezer so you can pop it in to heat up while you’re unpacking. Just have a plan to get back into your healthy eating routine and don’t beat yourself for whatever you ate on vacation if you end up splurging more than you planned. I’ll have specific restaurant recaps when we get back home, complete with lots pics of the food and other goodies! 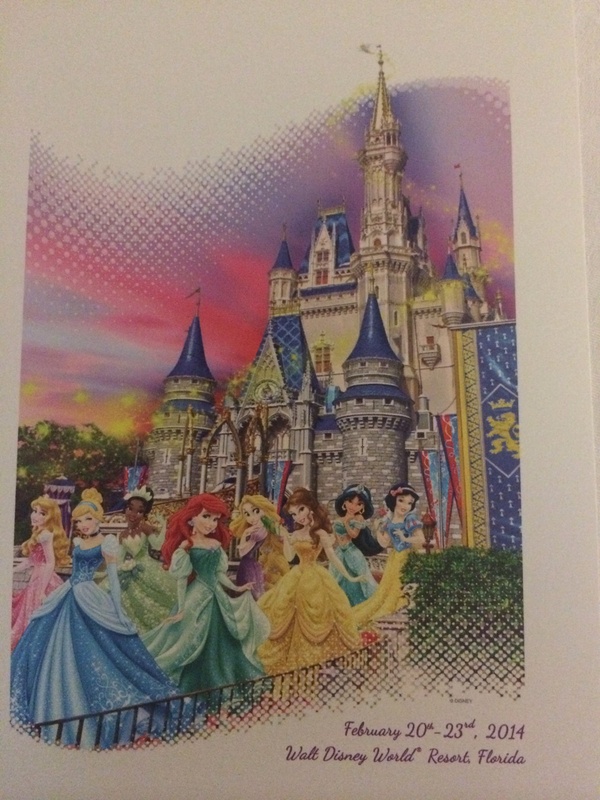 If you’ve been following any of the Princess Half Marathon Facebook groups for the last few months, you know the Expo is almost as much of an attraction as the race itself for many women. 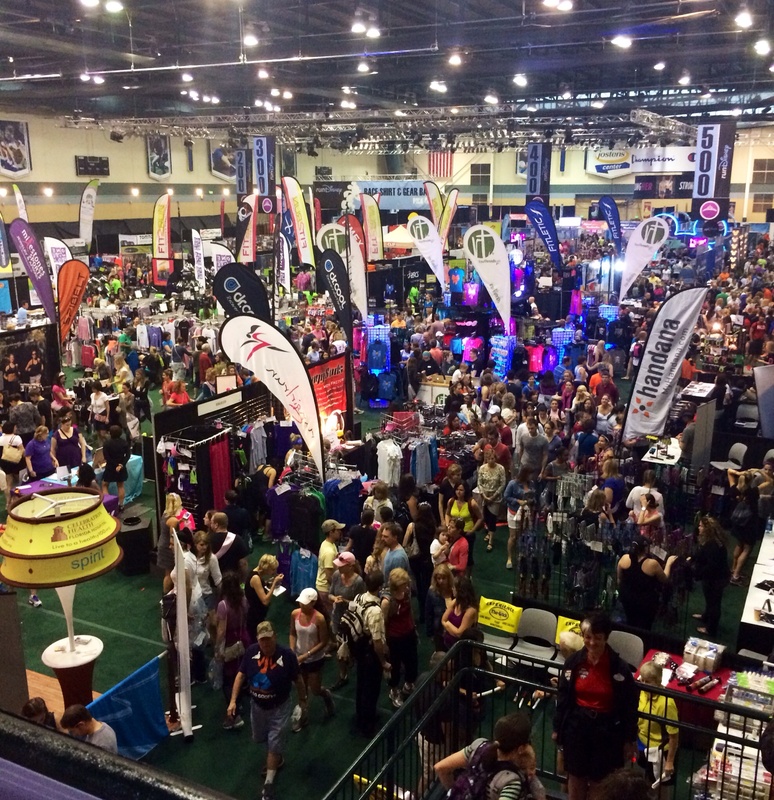 My only other experience with a race expo was with the Omaha 10K/Half Marathon/Marathon weekends, in which it took me all of five minutes to go through all of the booths and pick up my packet. 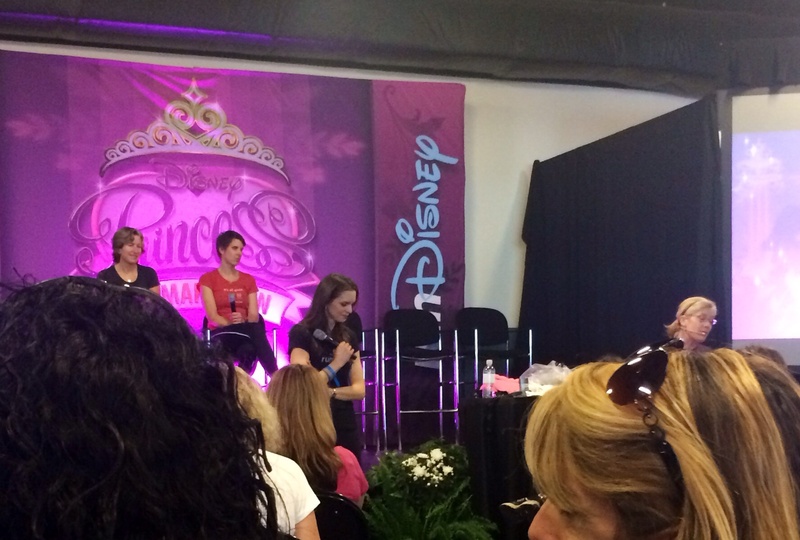 I had a feeling the Disney Princess Expo would be different and I was right! My flight didn’t arrive until 3:30 on Friday afternoon and as I was headed over to the RunnersLove meet up at the Polynesian as soon as I landed (late flight so I missed that – boo! ), I didn’t plan on getting to the Expo until Saturday. I wanted to go to the Tips for Race Day talk at 1 pm, so I actually didn’t plan on going to the expo at all until Saturday afternoon because I didn’t want to go twice. Thank goodness there isn’t anything I was absolutely dying to have! There are definitely lots of “gotta have it” items at the Expo, from the New Balance shoes (which I already know I can’t run in, so they weren’t on my list) to the specially race themed Dooney bags (also not on my list as I have a Coach bag I love – my goal weight reward to myself). The RunDisney booth had lots of race themed as well, ranging from t-shirts to headbands to cups and mugs. When I started seeing pictures of the items that were going to be available, I confess I started to get a little twitchy and worried that there wouldn’t be anything left by the time I arrived! Ultimately, though, I know I’ll get a tech shirt in my race packet and I’ll get a medal at the end and what else do I really need, right? On my “if it is still there, but I’m okay if it isn’t list” were the pink hoodie and the “My Mom ran the PHM” t-shirt for O (who loves the Cinderella mice!). 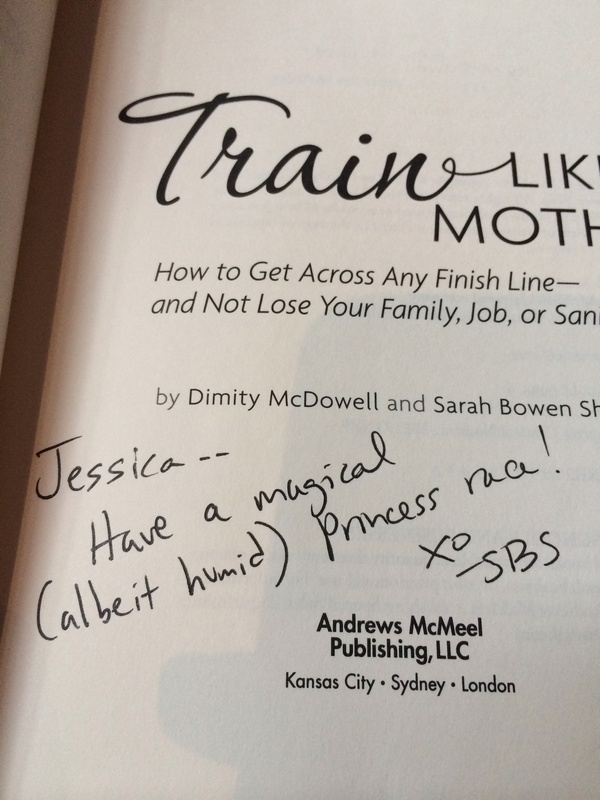 I was also planning on going by the Another Mother Runner booth to get my copy of Train Like a Mother signed, but that was really it on my Expo “to do” list. I didn’t want to get too committed to doing much at the Expo because I’m very claustrophobic and I’d heard the crowds could be bad. 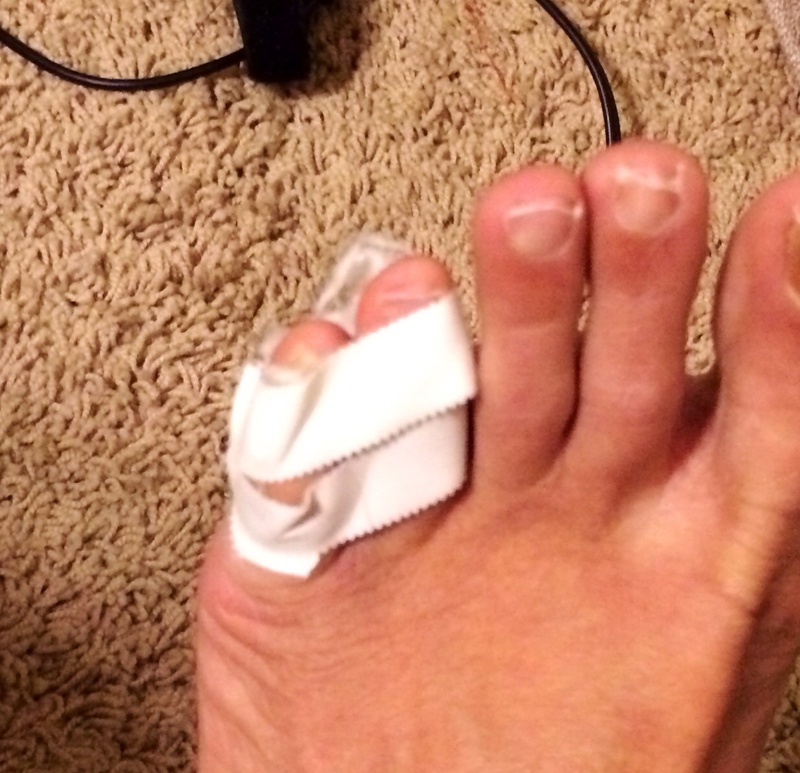 Also, I didn’t want to have anyone step on my poor toe before the race! After meeting up with a friend in Hollywood Studios for quick hugs and some lunch, I headed over to the WWoS complex for the Expo at around noon on Saturday. I had a tote bag with me to collect any goodies along the way. It was pouring rain when I got there and the buses drop you off quite a way from the buildings so I was soaked by the time I got inside! Thank goodness I brought two pairs of sneakers because the ones I was wearing ended up soaked. I headed inside to the RunDisney merchandise booth first and as I suspected,things were picked over. There was a generic PHM t shirt and the I Did It shirt, but that was it by the time I got there Saturday afternoon. 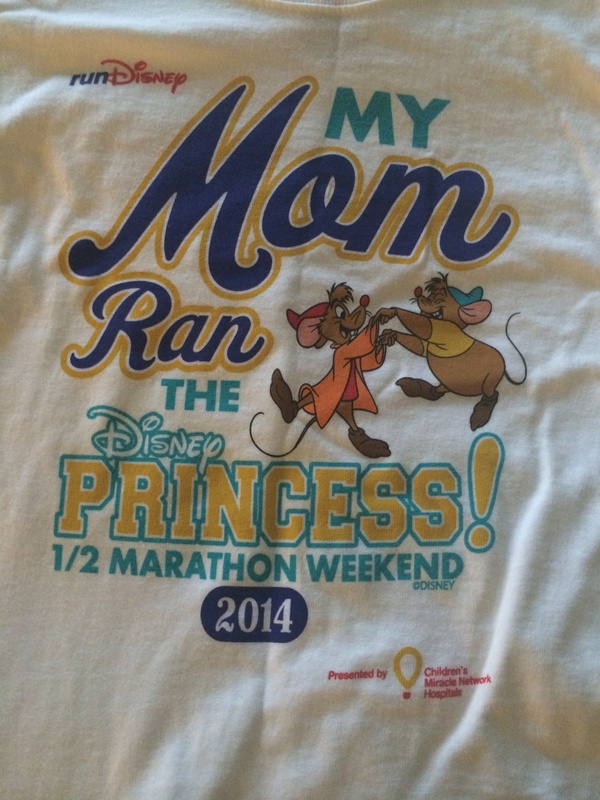 I did pick up the “My Mom Ran PHM” shirt for O, which was exciting, and a long sleeved, lined half zip RunDisney (not PHM) shirt since I know my cold weather running in Nebraska is not finished yet. 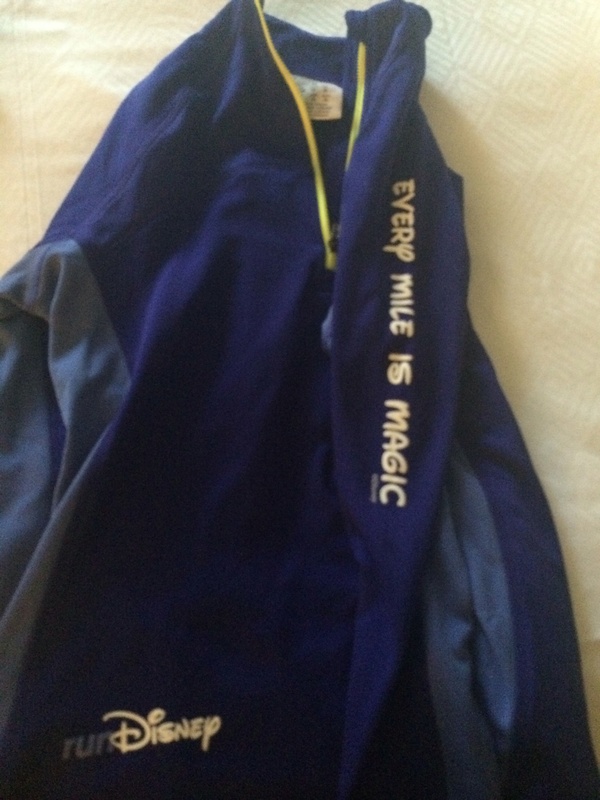 The sleeve says “Every Mile is Magic”, which I liked. I next headed across to the Field House (done raining hard thankfully) to pick up my packet, my Race Retreat arm band and my spectator package for Darrell. I also stopped and did the cute Prince Charming picture at the instragram booth. All in all, packet pick up was quick and easy at that time of day. They had a couple of characters there (Princess Minnie and Jasmine) but I didn’t feel like waiting in line since I knew I needed to head back across to the Expo to get my shirt. 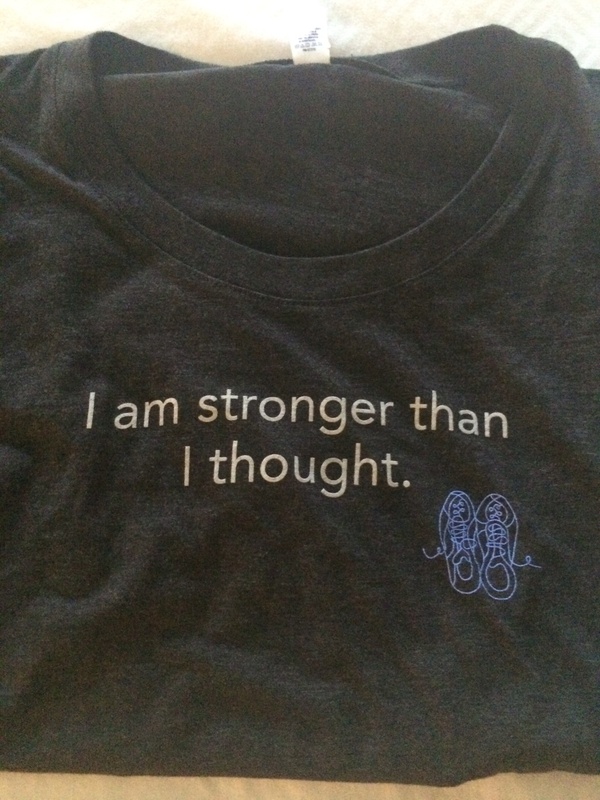 Back in the Expo, I found my shirt (not much in the gear bag for goodies this year) and then went by the Another Mother Runner booth to have Sarah sign my book and pick up a new shirt that was really speaking to me on this particular weekend (still stunned that I’m doing this)! 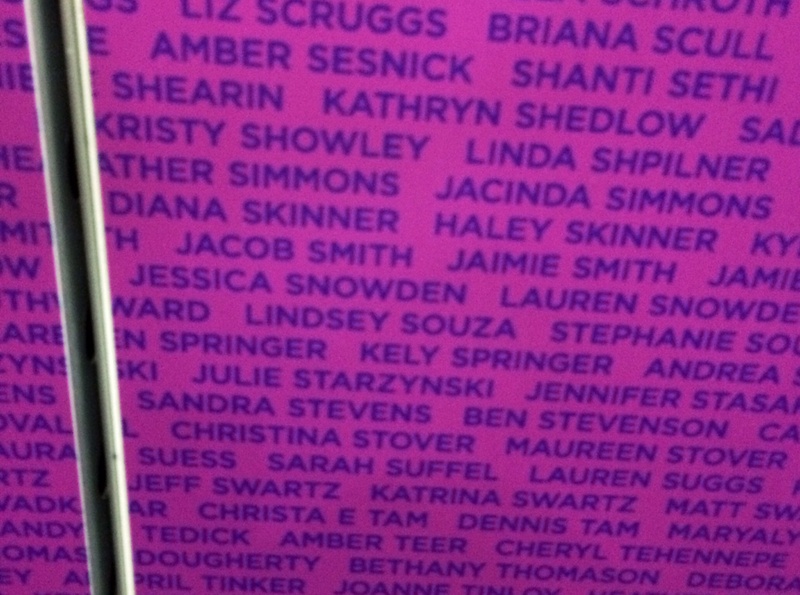 I also stopped by the New Balance booth to find my name on their giant wall of Half Marathon runners. This was starting to feel very real! All in all, I spent about two hours in the Expo (which includes the hour talk). It was still very crowded, despite the extra space in comparison to last year. I don’t know if it was just a lot of people picking up last minute items since it was the last afternoon of the Expo but I can’t imagine what it would have been like the first mornings! There were several cute photo backdrops and of course the footmen, but I didn’t feel like waiting in any lines since I knew I would be walking through the World Showcase to get to dinner later that night and needed to stay off of my feet as much as I could before the Half Marathon. I woke up early on Saturday (I think I was just too excited to sleep!) 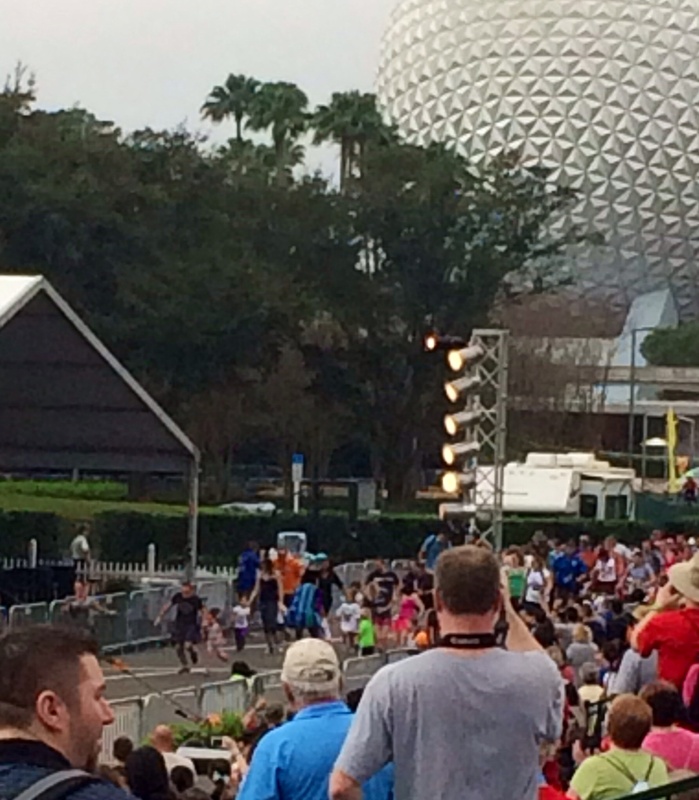 and decided to head out to Epcot to cheer on the end of the 10K and the kid’s races. 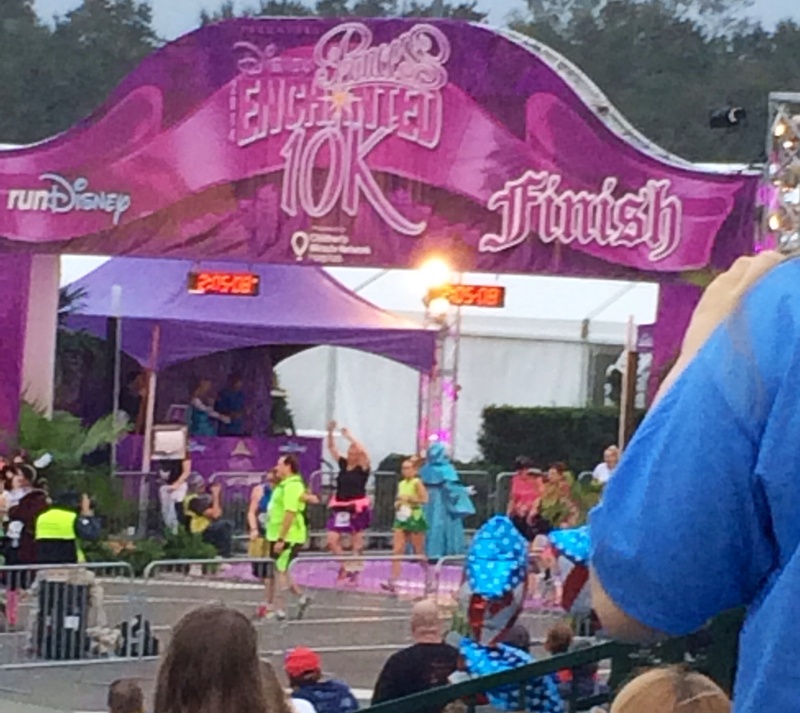 Staying at the Polynesian, it was easy to head out to the monorail at the TTC and hop over to the finish line. It was really exciting to see how everything was set up and to see all of the people! From a practical perspective, I really appreciated the walk through to get familiar with the layout for Sunday, especially to make things smoother for my husband when he tried to navigate all of that with O. 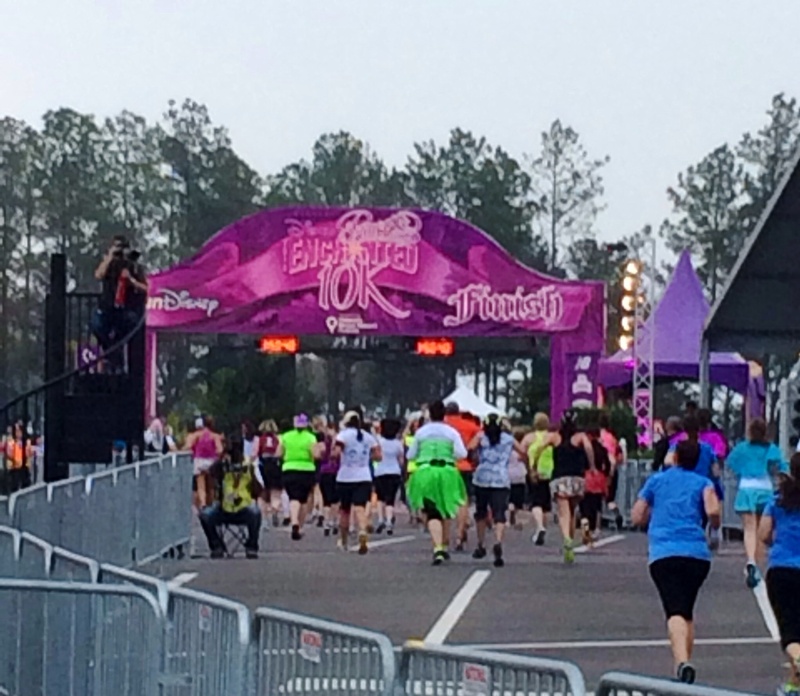 The 10K was run as an individual event, but many of the participants were there for the Glass Slipper Challenge (completing the 10K Saturday and then the half marathon Sunday). I’m so glad I got to come out and watch because I doubted I’d get to really spectate much on Sunday as other’s finished the half marathon since I’d have a demanding two year old with me who would no doubt be wondering where I’d been for the last few hours. 🙂 It was really thrilling to feel the energy at the finish line, with the music playing and the announcers calling out the names of the individual runners (as many as they could anyway – there were a lot of people!). The Fairy Godmother was greeting runners at the finish line, which was really fun, and occasionally I got to see Carissa, the announcer, in her Elsa running costume. I stayed to watch the very last runner, who was celebrated with confetti and seemed surprised that all of that was just for her! I found myself crying happy tears for all of those women (and a few men!) and anticipating crossing the finish line myself on Sunday. I waited around for the kid’s races as well and I’m so glad I did! The mile run finished at the same finish line as the 10K, so I was glad that the kid’s got some hoopla. 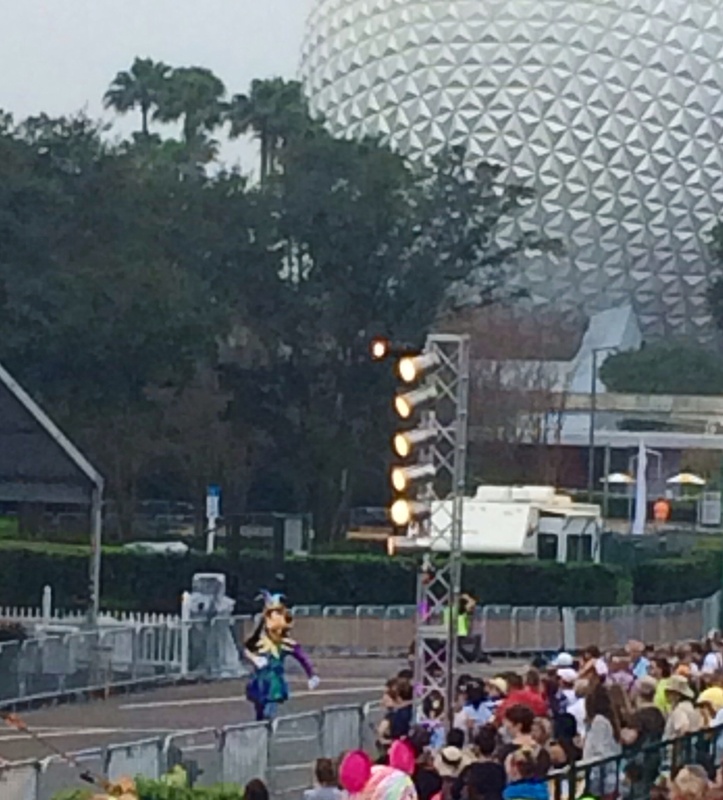 Goofy was out dancing and waiting to greet the finishers. The first kid’s finished the mile in a little over 6 minutes! Speedy! I was impressed how many very small kids there (I purposely didn’t get very close pictures because I wouldn’t want other people’s kid’s recognizable here) and how many families there were running together. It was so inspiring. I also watched the 100 yard dash, which was largely toddlers and so funny. Some kids were really into it and some were just not having it! 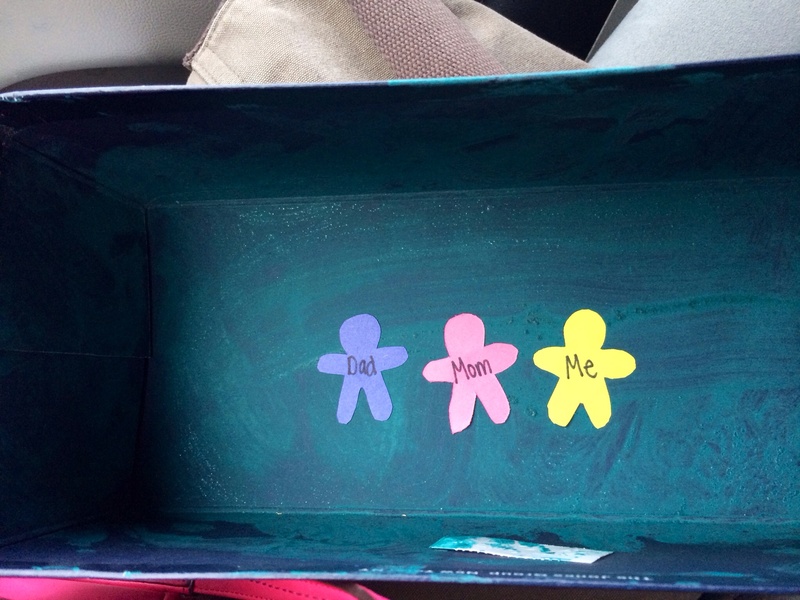 As a mom of a toddler myself, it was hilarious. 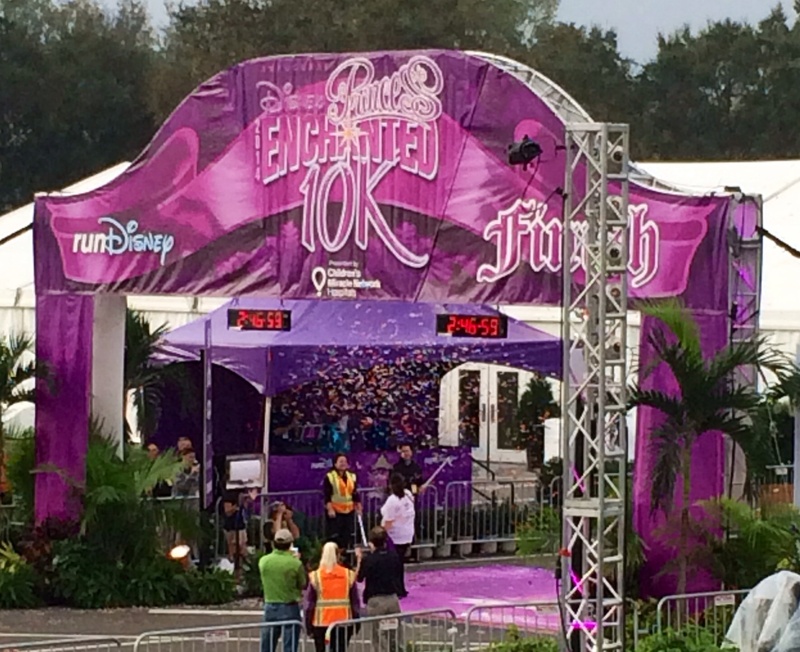 I definitely want to sign O up if we get back for more RunDisney events! Spectating these races Saturday morning was a great way to get in the spirit of PHM weekend! 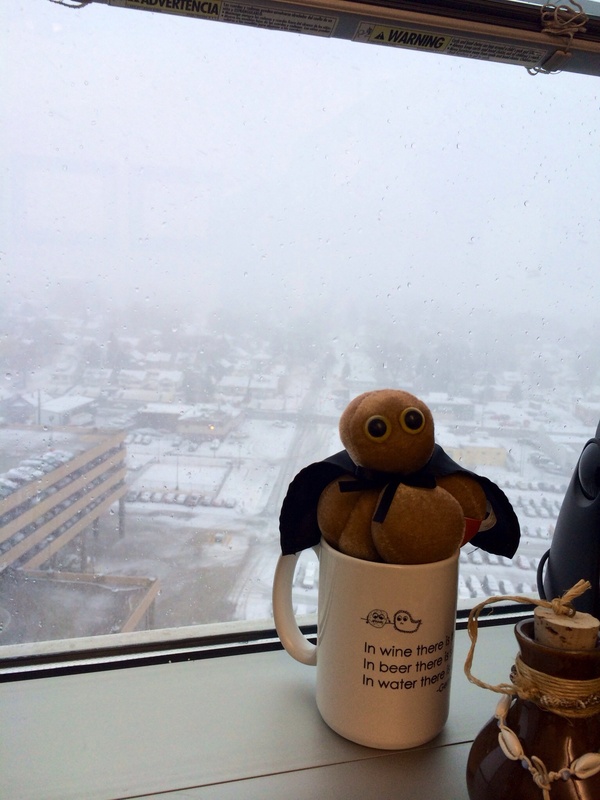 Weekly Wrap Up: It’s Finally here! 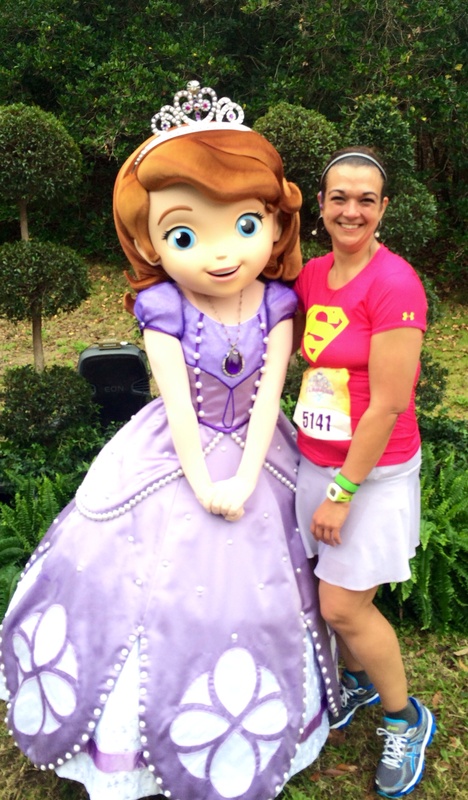 As this posts, I’m finally starting the Princess Half Marathon! I can’t believe it is finally here. I can remember sitting on the deck with my husband on a sunny summer day trying to decide just how crazy I was to think that I could run a half marathon. If I was going to test out my ability to do something so insane, there’s no place I’d rather do it that Disney World! This place holds so many happy memories for me and I’m glad to add one more to the pile. I may not have a full race report up for a while since I’ll be focusing on enjoying this time with my son and my husband more than blogging, but rest assured I’ll have the whole story for you ASAP! In the meantime, I’ll be posting lots of pictures over on the Facebook page for the blog so be sure to check it out. The plan for this week was to do two 30 minute runs, just to keep things loose, but primarily focus on rest and stretching (and packing!). That plan didn’t quite work out. Tuesday: Because of all of my travel snafus Monday thanks to a snowstorm in Indiana, I actually woke up Tuesday morning in Atlanta rather than in Omaha like I wanted to! 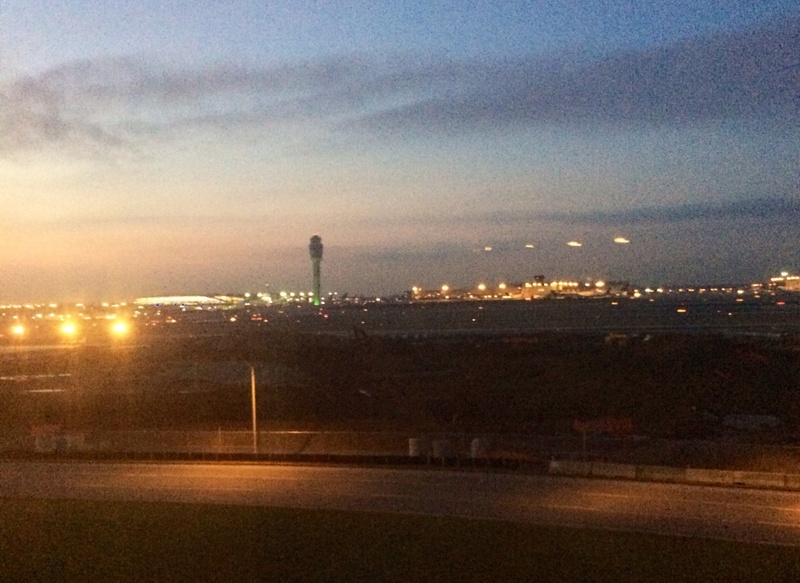 I went for a little run (15 minutes) around the hotel, so I get to mark Georgia off of my 50 states list and then I got in a 30+ minute walk in the Atlanta airport while I was waiting for my flight. I finally got home Tuesday afternoon and spent the evening hauling out suitcases to start packing. Every single time I get out the big suitcase, I manage to stub my toe on it at some point. Normally, it hurts at the time of injury but feels better shortly after. This time, I hit it hard enough that it was still sore on Wednesday morning. I actually ended up limping and had to change into my sneakers when I got to work so I could get around easier (yet another good reason to always have sneakers in your car!). I taped it up and crossed my fingers. Wednesday/Thursday: No workouts (other than packing) because of the toe issue. If it is broken, I wanted to give it as much rest as possible so I’d have a shot at finishing the half marathon on Sunday. Note that if it had been my big toe rather than my little toe, I’d have gotten an x-ray and probably pulled out of the PHM if it was truly broken. You rely on your big toe too much for balance for me to run on it and I definitely don’t want to risk long term damage there! I’m clumsy enough as it is. Little toes are less crucial (aside from “wee wee wee all the way home”, which is essential in life) and move less in daily function, so 4+ days of relative rest will hopefully get it back to normal. Friday: I got a fair number of steps in just walking through airports and the resort getting settled in to the Polynesian Friday night. I also went out for a short easy jog (didn’t even take my Garmin) just to see how my toe felt and to loosen up a bit in the Florida air. Saturday: No workouts and despite all of the wandering I did at the Expo and spectating some races in the morning, I really tried to focus on sitting on putting my feet up every chance I got. I also did some gentle yoga stretches in the morning and before bed. Starting Wednesday night, I really worked on hydrating (thanks for whoever started posting that on Facebook! I’d lost track of how close we got to the race). 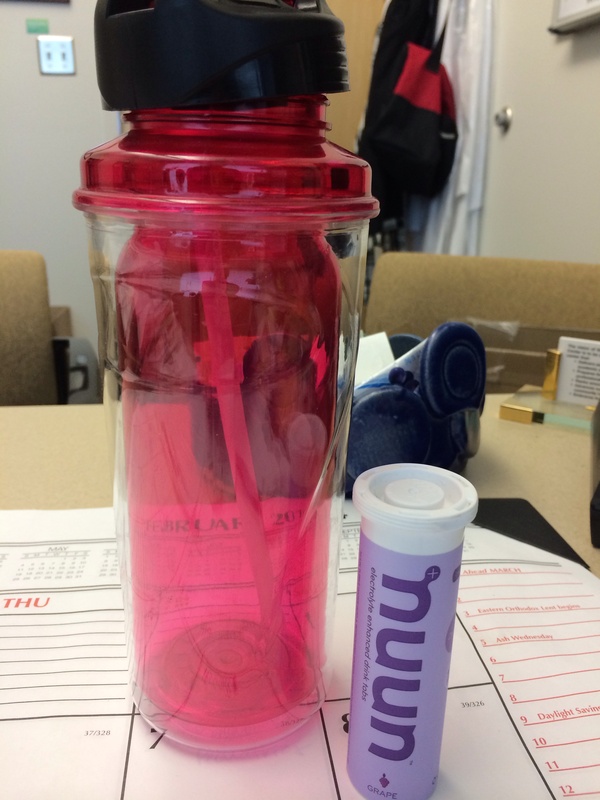 Wednesday night, it was just water with my Diet Coke at Village Inn, but Thursday onward I’ve constantly kept a bottle of water with Nuun by my side. I knew it would be warmer and more humid than I was used to in Florida and I wanted to be sure I had my tank full before the race. All of that hydration definitely helped get in some extra steps in a light workout week! Next time you hear from me, I’ll have (hopefully! knock on wood!) finished my very first half marathon! Send good vibes my way this morning! Thanks to all of you for your support along this journey! Lots of us will be flying in to Orlando this week from all over the world. Being the compulsive over-planner that I am, I spent a lot of time reading about and making lists about the things I needed to keep in mind with flying to a race. – If you need it for the race, bring it in your carry on! We’ll be checking a bag with the rest of our vacation gear, but in my carry on I’ll have my shoes, my running clothes for the race, my Gu’s, my music, my chargers and all of my essential paperwork. Yes, if something catastrophic happens, you could buy everything you could possibly need at the Expo but I certainly don’t want that added expense and stress. – Hydrate, hydrate, hydrate! It is important to hydrate before a race and if you’re spending part of your time pre-race on an airplane, that’s particularly important because a) airplanes tend to have drier air and be dehydrating and b) with the low resting heartrates of runners, being immobile on a plane for a long time can increase your risk of a blood clot if you’re dehydrated. Thanks to TSA restrictions, you can’t bring big jugs of Gatorade with you from home but you can bring the powdered mixes (or Nuun tablets, which is my plan) and a water bottle. You can also buy water or Gatorade/Powerade once you get through security. Drink up! You might also mention it to your flight attendant when they’re drink service, to see if they can give you a bottle of water to avoid being called for lots of refills of your little cup. You’d be surprised what a smile and a thank you can get you. – Keep moving! All of that drinking will have you going back and forth to the restrooms on the plane a lot, which is good for decreasing your chance of clot and minimizing the fluid that pools in your legs when you sit a long time. Having an aisle seat makes it a lot easier to get up to do this, so think about requesting one for your flights to/from the race, even if you’re normal a window seat person. Moving around will also help with a lot of stiffness if you’re flying back shortly after the race. – Compression socks can also help with the swelling and clot risks, so if you have them be sure to wear them on the plane coming and going from the race. – Remember that fueling for the race doesn’t just happen during the race or the night before. Ideally, you start optimizing your nutrition in the week before the race and gradually increasing your carbohydrates over a few days. You also want to avoid getting any stomach issues from eating unfamiliar airport food on top of a stomach that may already be wired with excited nerves. Bring along some healthy snacks or your favorite pre-run fueling options and stick to familiar options in the airport food courts. Better safe than sorry! Experiment and try new things when we’re celebrating crossing that finish line! – You’re crowded with a lot of people, so avoid anyone who is coughing or sneezing, wash your hands a lot and use hand sanitizer. You don’t want to catch something on the plane that’ll ruin your race morning! 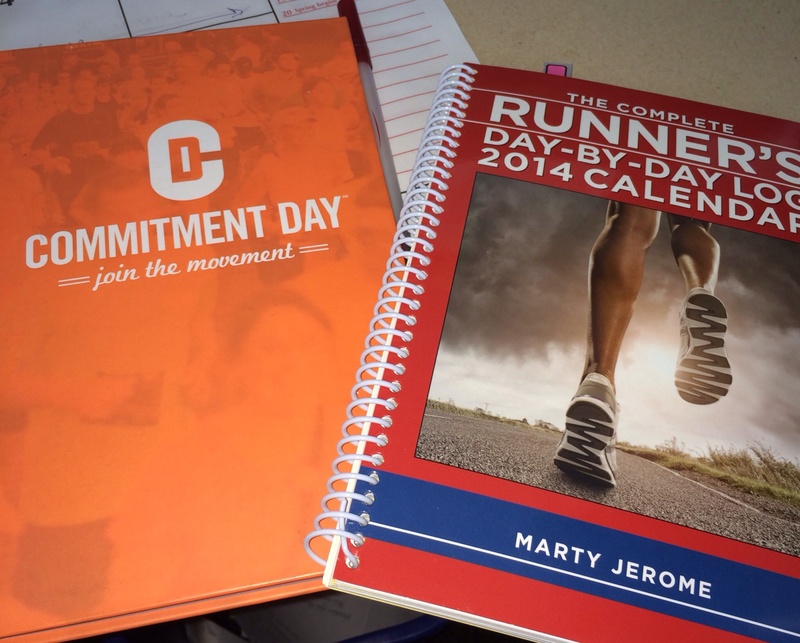 – I’m personally going to bring my race information packet to read over again on the way there and my training journals, to help reinforce that I really am ready for this and I really have come a long way! Have you flown to races before? Any advice? 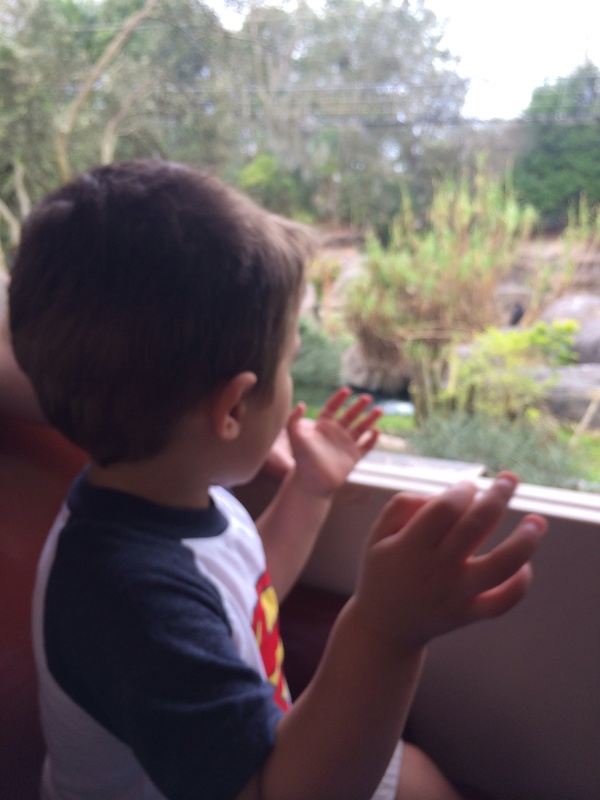 Friday Favorites: Flying away to Florida! This has been a crazy week! My travel back from Indiana got disrupted by a giant snowstorm, rerouting me through Atlanta overnight Monday. The only pluses to that would be a) I got to meet another friend’s baby for the first time – loads of cuddles this weekend! and b) I went for a run outside my hotel room, getting to mark Georgia officially off of my running in all 50 states list! As I’ve spent a week packing and checking and rechecking my to-do list over and over again, this post from Huffington Post about the Real Reason Moms Need Vacation gave me a much needed smile. Thankfully, my husband is a “all we really need is ID and our credit card” kind of guy, so I have some balance to my packing neurosis. 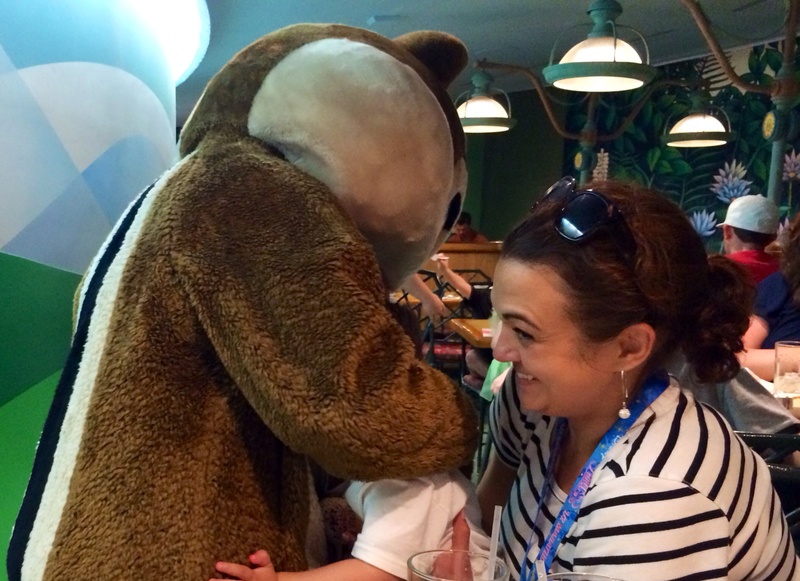 While I was in Atlanta, I got to have breakfast with a dear friend and her little girl. One of the things she asked was what foods I missed eating and I told her I honestly couldn’t think of any, which really is true. I actually tend to miss my favorite healthy foods, like roasted veggies and greek yogurt, when I’m away from home more than I miss brownies or french fries. I think a lot of that comes from my approach to eating the entire time I’ve done this. Every day, I wake up and choose to make good choices. It isn’t about what I can’t have, but what I can and framing it that way has helped keep me from being deprived. This post from Authentically Emmie this week talks about the same idea – reframing your choices as voluntary and positive is so helpful when you’re trying to change any health habits. And finally, as so many of us (myself included) are angsting about our ability to complete a half marathon and achieve our goals this weekend, please read this post from Cammy about Better. The part that particularly jumped out to me was the quote about it being better to meet 80% of a stretch objective than 100% of something that wasn’t challenging. We have challenged ourselves to complete a half marathon this weekend and just by starting, we are better than we were before. Congrats to us! Runner tracking allows all of those cheering you on at home to follow along with your progress through the race (assuming they’re up that early!). It also makes it a lot easier for those that will be cheering you on in person to find you along the course. We’ll be using it primarily so that my husband knows how I’m doing, although he’ll also be able to see me through the RoadID tracking app and I’ll have a print out of the race course for him. My 10K in Omaha theoretically had live runner tracking but it didn’t really work. We didn’t get any notification until I was already done with the race. I’m hoping it works better through Disney! 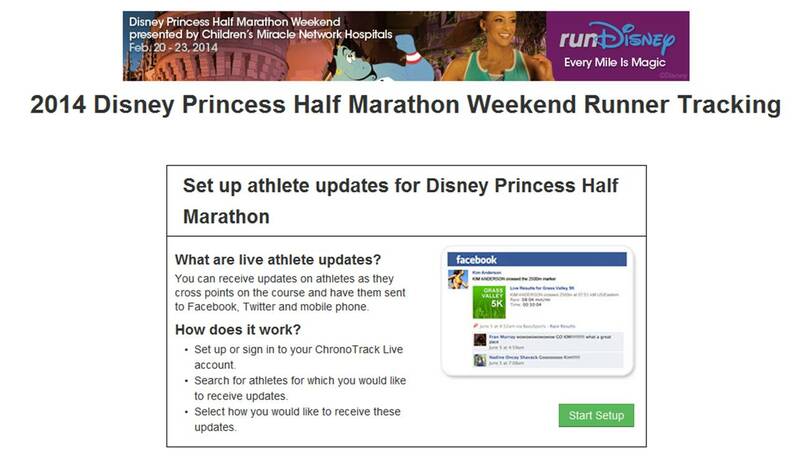 There is link available via the RunDisney website to set up tracking before you get to Disney. Be sure you have the email addresses and phone numbers of anyone who needs updates via text or email. If you have trouble going through the online registration process, there are volunteers at the Expo that can help you set it up before the race. You can also set up notifications via Twitter and Facebook. 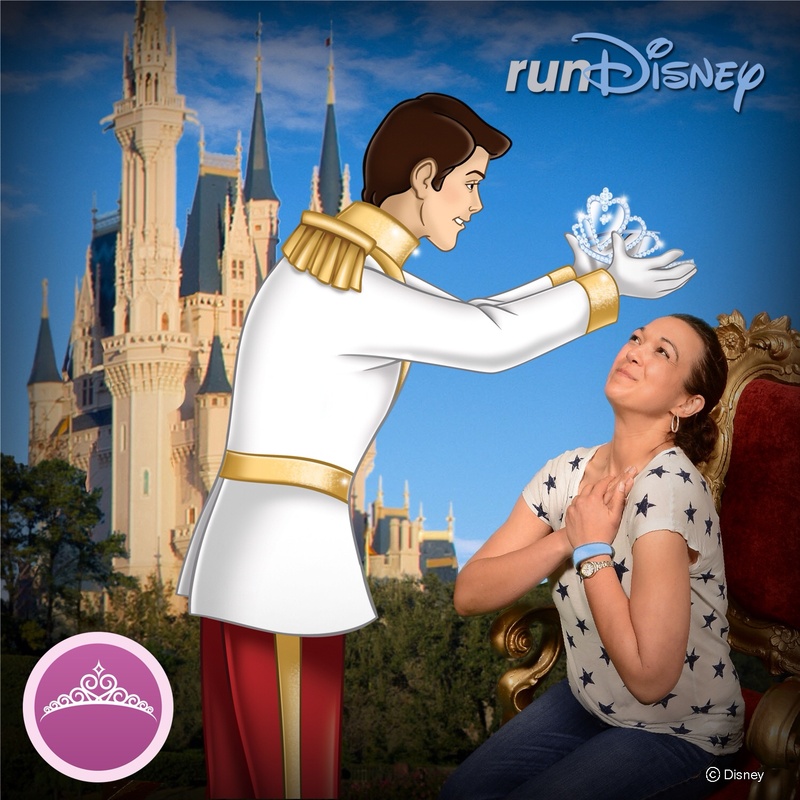 I’ve loved watching the posts from people I follow via social media during marathon weekend and other big RunDisney events in the last few months. As you cross the sensors at the major split points (5K, 10K, 15K and finish) updates are sent out, so be sure you actually cross those sensors in the road! At least via Twitter, it also sends out a projected finish time with those splits as well that changes based on your pace as you go along. There is a very cool function via the ESPN WWOS site that lets you figure out where the best viewing spots are going to be for you to match up with your spectators. 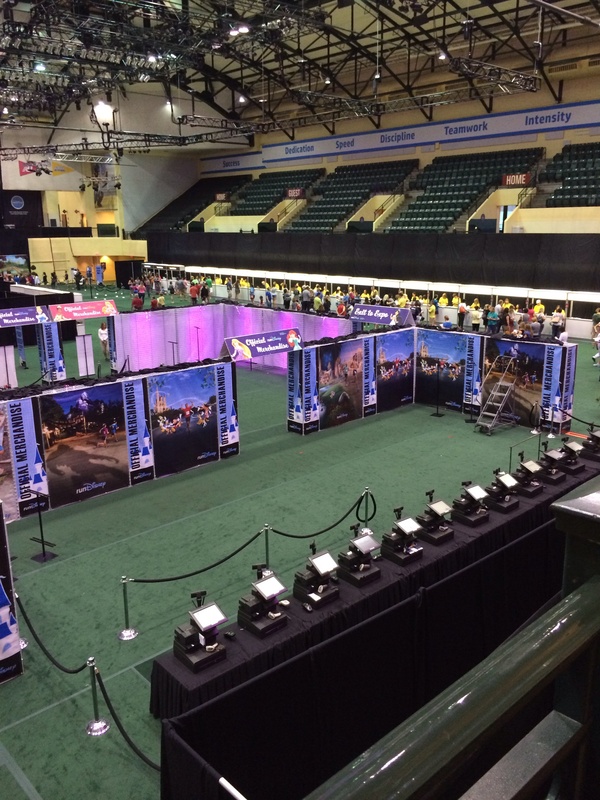 You enter your race, your pace and the things your spectators want (all possible viewing options or for us, “staying at the Polynesian”) and it tells them where the best options are, how to get there and when to be there. Very cool! A) Anyone can run. If I got started doing it, anyone could (or whatever exercise you like). B) Running may not be the cure all for weight loss that you may think it is. I still attribute the majority of my weight loss to changing my eating habits. Yes, running is an efficient way to burn calories and it is the exercise I enjoy, but many people actually experience weight GAIN rather than loss when they’re running. I’m glad I waited until I was in maintenance to commit to a half marathon because it would be hard to balance fueling for increasing endurance events with the kind of calorie watching I was doing when I lost weight. So if running burns so many calories, why don’t you always lose weight when you start training for a race? There are lots of things that could be playing a role. The most common problem cited by nutritionists and trainers is overestimating your calorie burn and underestimating the amount of calories you eat. If you’re tracking calories, the latter is hopefully not as much an issue but it can be difficult to figure out how many calories you are burning. The calorie burns on a treadmill are notoriously unreliable and the estimates provided in online tracking calculators may not be much better (although most of those do at least factor in your weight, an important variable). Heart rate monitors are said to be much more reliable, but I haven’t tried one of those yet. I generally plan on letting myself eat about half of the activity points I earned via WW (if any) to account for the fact that it probably overestimates my calorie burn. It’s also important to remember that your calorie burn is going to change as you run more and more often because your body gets more efficient. If you are losing weight, that means you’re burning less to move your mass through space as well. Applications like Weight Watchers and SparkPeople do factor your weight into their calorie burn estimates, but I don’t know that any really factor in overall fitness (again, other than a heart rate monitor). Another issue is letting the “I earned it” mentality bleed over into the days before and after your big workouts. I can definitely see myself falling into this trap sometimes, saying that I can eat bigger on Friday because I have a long run Saturday (gotta carb load, right? ), eating my calories burned on Saturday itself and splurging Sunday because I ran the day before. 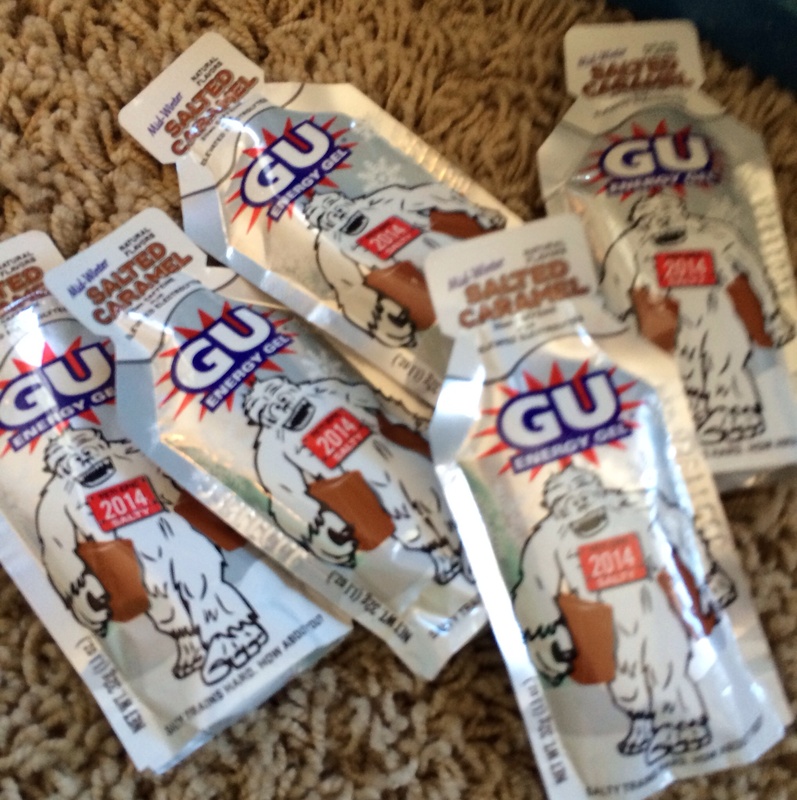 It doesn’t take a lot to eat more than you burned,especially when you factor in the Gu/gel/fuel you take while running and the electrolyte drinks on the run. We also have to remember that running a few miles in the morning won’t make up for being inactive the rest of the day. 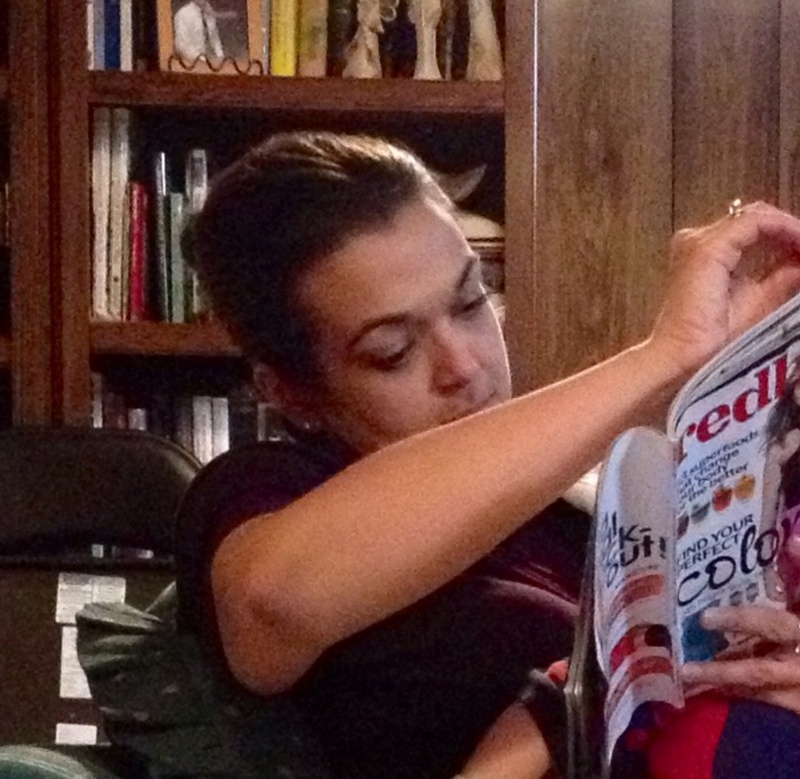 This weekend, I ran 3 miles in the morning and then spent the rest of the afternoon hanging out reading (in my defense, I was cuddling a sleeping baby). My overall step count and calorie burn for the day was lower than usual, despite the 3 miles, because I spent the rest of the day inactive. It’s certainly possible to lose weight while running, but you have to be watchful of your ins and outs. I’m glad I waited to tackle my first half marathon until after I’d lost the majority of my weight so I didn’t risk underfueling for my runs because I was worried about gaining weight or undoing my weight loss progress with those fantastic Salted Caramel Gus (I keep them in my TARDIS cookie jar because the “whoosh” noise keeps my honest about sneaking into the jar to snack!). Now, my priority is running well and safely and I approach my food with that in mind. My goal is not to lose weight and I actually loosened my “maintain” range mentally to go up to 170 pounds for the last two months (although I’ve come nowhere near that) to give myself permission to figure out fueling for this race. I’m reminding myself a lot this week that “carb loading” doesn’t mean eating giant plates of pasta all week to get ready for Sunday. I’m keeping things sane and healthy and keeping track of what I eat. I really recommend Mickey Miles Podcast episode 123, with dietician Tara Guidus, because she does a fantastic job discussing a realistic approach to these issues. Have you ever gained weight while training for a big running event?